Demography and the Possible – Patrick F. Clarkin, Ph.D.
As Hans Rosling has stated repeatedly, life expectancy has improved dramatically for most of the world over the last 200 years. His website, gapminder.org, is a practical and visually beautiful way to explore statistical shifts in demography, economics, and health over time and geography (highly recommended). As far as one trusts the data, things really have gotten better for the world, at least by this metric, although wide gaps obviously remain between high and low income countries. Still, as Rosling says in his highly entertaining style, the seemingly impossible is possible in making a better world. He also reminds us that the ultimate goal is not economic development itself. Rather, economic development is a means to the more important ends that give life meaning: health, dignity, culture, and happiness. That reminder is important, as we try to keep simultaneously in mind both micro- and macro- perspectives, the big picture on a societal scale and the little details of individual lives. For example, in addressing the psychology of philanthropy, Nick Kristof notes that people are motivated to donate more by individual stories than by statistics (summarized by the maxim “one death is a tragedy, a million deaths is a statistic”). 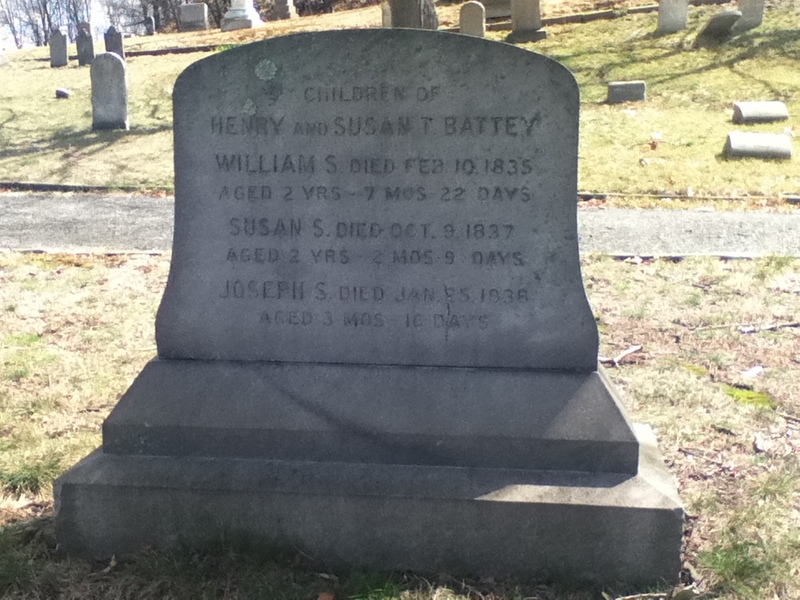 I think of Henry and Susan Battey, or at least who I imagine them to be, and wonder how much pain and distress they endured with the early losses of all three of their children. To them, surely it would matter little that there would be an uptick in life expectancy in the U.S. a mere few decades after losing their children. Statistics and data are essential at understanding the way the world works, but the picture is incomplete without the context and meaning that individual lives and experiences provide. This entry was posted in Altruism, Demography, Life, Life expectancy, Population Health, Psychology and tagged Gapminder, Hans Rosling, Nick Kristof. Bookmark the permalink. 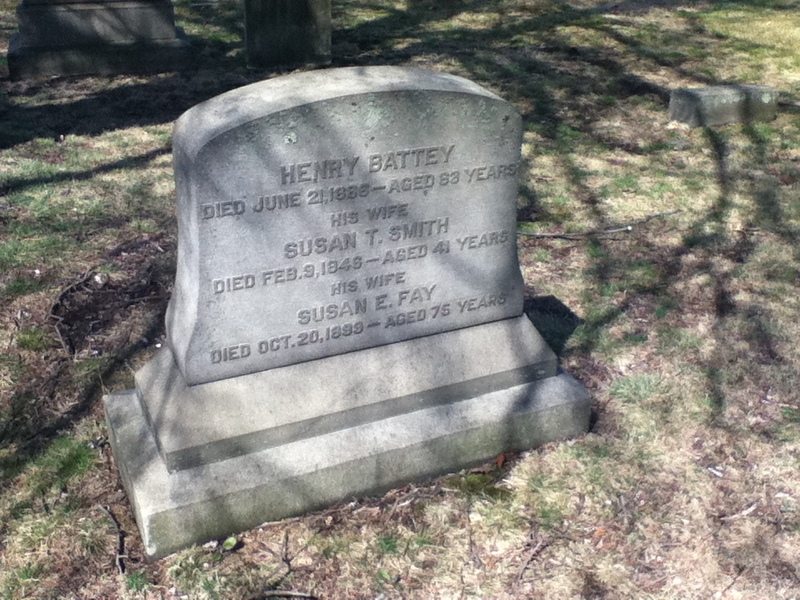 Huh, Henry had two wives, both named Susan? (I’m assuming at different times and not that he had two at once.) And then named a daughter Susan. Interesting how the nomenclature of our society has also changed (e.g., very few people have daughters named after mothers, but very many have sons named after fathers). Hi Kristina, the Susan thing occurred to me too. Odd pattern (I mean the two wives both having the same name, not the daughter being named after the mother). Your project sounds interesting, and I’m sure the students enjoy it. The archaeologists here at UMass Boston do something similar as well, but I don’t know all the specific details of the assignment. FYI, this headstone is mid-range in terms of age at the local cemetery. There is a section with much more recent graves and others that date to the early 1700s. Pretty neat. I found one where the person was born in the 1600s, but forget where it is. I’ll keep looking.